Being the leading names in the industry, we are offering an extensive range of Texture Analyzer. This analyzer is used to measure adhesiveness, apparent modulus, breaking point, burst strength, chewiness, coefficient of friction, cohesiveness, consistency, elasticity, fracture force, gel strength, gumminess, hardness, pliability, relaxation, ripeness, spreadability, tackiness, yield point. Keeping in mind the industry defined guidelines, the offered analyzer is manufactured using quality tested components as well as cutting-edge techniques under the stern direction of adroit technocrats. Adhesiveness; Apparent Modulus; Breaking Point; Burst Strength; Chewiness; Coefficient of Friction; Cohesiveness; Consistency; Elasticity; Fracture Force; Gel Strength; Gumminess; Hardness; Pliability Relaxation; Ripeness; Spreadability; Tackiness; Yield Point. 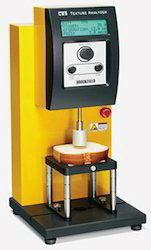 Description: The CT3 is a low cost, but powerful, universal testing machine that offers both compression and tensile testing. The CT3 performs like a high end texture analyzer but at a fraction of the cost. Looking for Texture Analyzer ?